Today (well, a few days ago now, because it has taken me so long to get this done! ), I discovered that I have been nominated twice for the Liebster Award. I feel doubly honoured and twice as happy! One nomination came from Tania @ Writereads, whose blog I have only recently discovered, but have been enjoying ever since. Tania is funny and she’s Canadian. Need I say more? My second nomination came from Lindsey @ Reeder Reads. Her blog is new to me also, but is full of wonderful and interesting stuff. And huge brownie points for being from Nova Scotia (just found that out!). If you haven’t already, please go check out these unique and fantastic Canadian book blogs! 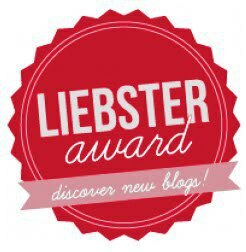 The Liebster Award allows bloggers to gain more exposure for themselves as well as for the blogs that they in turn nominate for the Award. The Liebster Award consists of four parts: state 11 random facts about yourself, answer 11 questions about yourself that were given to you by your nominator, nominate more blogs, and give your nominees 11 questions to answer. So, because I was nominated twice, I am going to take that to mean I double everything. I don’t know if this is officially right, but I’m going to do it anyway. It only seems fair. 1. I started this blog as a reader, not a writer, so if you ever feel as though I didn’t learn anything in English class, you may be right. I just like to talk about my books! 2. I love all colours, but especially yellow. 3. I like to go camping, and sleep in my old, but wonderful tent trailer. 4. For our Honeymoon, my husband and I rode a tandem bike around the perimeter of Prince Edward Island. 5. I play flute in a band. 6. Our family goes through 6 4L jugs of maple syrup every year, which we get from friends at their maple syrup farm. 7. Kids are attracted to me like magnets. 8. I have 5 brothers and sisters, 3 of whom are adopted. 9. To this day, I have never owned a cell phone. 10. I’ve never worn make-up, even on my wedding day. No hair dye, either. 11. When I was younger, I wanted to be a marine veterinarian. That didn’t quite work out. 12. I have a secret wish to live on a farm. 13. I hate to clean my house. If you ever come over, you’ve been warned. 14. I love making cakes for my kids birthdays, but then I worry about them turning out just right. 16. My favourite season is Fall. I love the cooler days, and the colours on the trees are so pretty they hurt. 17. In Junior High I took social dance lessons with a friend. We learned the waltz, the fox trot, and the jive. We loved it! Everyone else in the class was 50+. 18. I have the BEST neighbours! 19. I’ve kept a list of books I’ve read since Grade 8. 20. I like math. That’s all I need to say about that. 21. My favourite movie as a kid was Mary Poppins. I still know all the words to every song. My kids keep telling me to stop singing along. 22. I still have my entire collection of Lucy Maud Montgomery books. They have been with me through thick and thin, and they now have a place of honour on my daughter’s shelf. 1. What is the one book you could never ever part with or get rid off? It’s not easy to pick just one book. If I could pick my Anne books, that would be easy. If I could pick my collection of A.A. Milne books that belonged to my Mom when she was little, that would be easy. But one book is not. I would have to go with my complete volumes of Jane Austen that used to belong to my Grandmother. It’s cheating a bit, since it includes several books, but they are all bound together. 2. Paper books or eBooks? Why? Paper, always paper. I love to be able to feel the heft and flip through the pages. Paper books are beautiful. Ebooks are stiff and have no character. 3. If you could travel to one place in the world (all expenses paid), where would it be and why? This one’s tough. My first reaction is to go to Antactica, because I have always wanted to go, but I also think it would be awesome to travel across Canada at a leisurely pace and explore all the nooks and crannies of my own country before moving on to others. This would also include the Arctic, which is kind of similar to the Antarctic. 4. If you could meet one author (dead or alive), who would it be and why? There are so many, but I’m going to say Margaret Atwood. She is just so great! 5. Do you play music while you read? No, I would never be able to concentrate. I need quiet, or at least almost quiet. 6. If you could create a dish with any cookbook author, who would you want to cook with? I don’t know many cookbook authors, but if there is one who cooks thai food, I would go with that one. 7. If you were given $5000 to spend in one store in the world, where would you do your shopping? I’d like to say the book store (an independent one, of course), but I would also need some new shelves for my new books, so I would have to buy a couple of their shelves as well. That’s my selfish answer, but if I consider my whole family, we would probably go to a furniture store, because we still have no real living room furniture. I would also like a comfy armchair by the fire. 8. Do you have a favourite quote? Can you share it with us? There are so many great quotes, but my favourites are often the simplest. I love “Dance like nobody’s watching.”, because sometimes I do that and it does feel great! 9. If you had to be a member of a literary family, which family would you join? I think I’d fit right in at The Weasley’s. Nice parents, rowdy kids, chaotic household, but also warm and secure. Except, of course, when Voldemort comes to visit. Also, I could use magic to help me clean and cook. 10. Do you have a bad habit when reading? Twirling hair? Clicking your tongue? Tapping your foot? Um, eating. What could be worse than that, really? I love nothing better than sitting down to read in front of the fire with a cup of tea and a yummy snack. 11. Who is the one author or book that has changed the way you read? Ah! Another hard one. When I was young, L.M.Montgomery showed me that I could love a book with a good story as well as one with lengthy descriptions (as long as they are well done). After her books, I wanted bigger, better, and more in depth. No more kids’ books for me! 1. Have you ever lied about having read a book? I’m wracking my brain, but I don’t think so. I’ve probably wanted to, though. 2. Do you read while visiting the bathroom? Yes! I always have a book in my bathroom called my bathroom book. This started when the kids were a lot younger, and I would hide in the bathroom when I got a chance and read for a few minutes. It’s a good way to get a few more pages in. 3. What is your favourite book by a Canadian author/which Canadian author would you most like to try reading? It’s so hard to choose just one! There are too many- really! See my 10 Canadian Book Recommendations. A Canadian author that I still have yet to read, but would like to, is Lynn Coady. 4. Do you ever feel embarrassed by the cover of a book you are reading in public? Only if it has a provocative cover. I don’t want anyone to think I’m reading a romance. 5. What was the last book that made you laugh out loud? The Woefield Poultry Collective by Susan Juby. Review to come. 6. Is there any movie that was better than the book? Yes, but not many. Books that I don’t have time to read, but I’m interested in the story, like books about historical figures. I often like to see them as a movie. 7. What is your favourite type of jam/jelly/marmalade? 8. What is the worst song to have spinning through your head? 9. Which character did you see yourself as when you were a kid? And now? When I was little I wanted to be Pippi Longstocking. Who wouldn’t want to live like her? 10. What is your comfort food and which restaurant makes it best? Soup. I love soup, especially creamed soups. I’ve had some good ones in some strange places, but I don’t have a favourite restaurant. 11. If you could be re-reading any book right now, which one would it be? All the books on the list from question #3. Are you still with me? I’m not sure that I am, but I think we’re almost done, right? Except, this is the hard part, because there are so many blogs out there, and Tania has already nominated many of the blogs I love and read often. Also, if I nominate you, and you have already received this award from someone else, feel free to ignore it. I will do my best not to duplicate. Don’t forget to check out these great blogs!! 1. What was your favourite book when you were a child? A teen? Now? 2. What was your most memorable trip? 3. Have you ever met a well-known author? What was your experience like? If not, which one would you like to meet? 4. What is your favourite reading spot? 5. Which literary character would you most like to trade places with? 6. If you could have anything you wanted for your next meal, what would it be? 7. What prompted you to start your blog? How did you come up with your blog title? 8. Are you an animal person? Which kind? 9. Are you a city mouse or a country mouse? Why? 10. Do you have a book that you take with you everywhere you go? 11. Are you a multiple book reader, or do you prefer to read one at a time? If you made it to the end of this enormous blog post, I am impressed, and now you know a lot more about me, whether you wanted to or not! Thanks again to Lindsey and Tania for nominating me for this Award! It was hard work, and it took longer than I thought it would, but I thought I should try to do it in the spirit of the award. By the time I was done, I felt so jumbled and done with it, that I just closed my eyes and pressed ‘publish’. Hopefully it is somewhat coherent. I don’t blame anyone who can’t make it to the end. Thanks for reading it! Yes, I must read Lynn Coady. Do you have a favourite? Thanks for the suggestion! I remember looking for that one at the library once, but it wasn’t there, and then I forgot all about it. This time, I will write it down. You asked some good questions…I’ll answer them soon! Aw, thanks for the compliment Cecilia! I think this award came at a good time. I’m starting to feel more comfortable sharing things. You and all my other bloggy friends have been so welcoming. I can’t wait to hear what you have to say! Congrats to you! That list of books you’ve read must be pretty amazing! Yay, congratulations! I loved reading your answers to all of the questions! That’s so interesting that you’ve never owned a cell phone! Do you ever find it inconvenient? Sometimes I have days where I don’t really use my phone but it’s kind of a safety blanket for me. How long is the list of books you’ve read? I bet it’s really long! Have you filled up notebooks with it yet? I think it makes a difference that I grew up without cell phones. And I know once I have one it will be hard to go back, so I’m holding out as long as I can. The day will probably come when my oldest daughter starts going out a lot. We’ll see. At first my list was just on looseleaf, but a couple of years ago I transferred it to a notebook. The notebook is pretty big, so I’ve still got a long way to go. I’m happy to have found your blog too! wow this is way more demanding than it was 2 yrs ago! Congrats! Great insights. Shout out to hiding from your children in the bathroom. Thank you for the nomination! It was so nice to learn more about you. It was actually kind of fun. I hope you have fun with it, too! Loved your post, Naomi! Thanks for telling us more about yourself. (I discovered your blog through ‘My Book Strings’ – your blog is great!) I will look forward to reading your thoughts on books. I loved your list of top 10 Canadian books. I have not read many books by Canadian writers, but have loved the ones that i have read. I have a question for you – a trick question 🙂 Do you like reading French-Canadian literature? Who is your favourite French-Canadian writer? I have read a few and love them all (my favourite is Nicole Brossard) and so I thought I will get some recommendations from you. Hi Vishy! Thanks for visiting my blog! You have asked me a very good question – it got me thinking. When I started my blog, it was partly to challenge myself to read more CanLit, but, unfortunately, most of the CanLit I have read has not been from French Canadian authors. Not for any reason other than that I go with my mood and with the books that enter my radar. I have not yet gone looking specifically for French Canadian books. Thanks to you, I have looked up a list of French Canadian authors, and will try to actively seek out a few – maybe for my next CanLit Challenge read! Any recommendations? Hi Naomi 🙂 ‘And the Birds Rained Down’ by Jocelyne Saucier looks like an interesting book – I love that title. I will look for it. I have heard of Kim Thuy but haven’t read any of her books. They look quite wonderful from your description. I will look for her books. Thanks a lot for the recommendations. Some of my favourite French Canadian books are these – (1) ‘Yesterday, at the Hotel Clarendon’ by Nicole Brossard (Brossard’s prose is gorgeous – in my opinion she is one of the greatest prose stylists at work today. This is about a museum curator and her family and friends. ), (2) ‘The Mark of the Angel’ by Nancy Huston (Huston’s mother tongue is English but she writes in French. This one is about a German woman who moves to France and gets married to French musician. Then as fate has it, she falls in love with a Hungarian man who is Jewish. A beautiful, achingly sad love story. ), (3) ‘The Peculiar Life of a Lonely Postman’ by Denis Theriault (it is the story of an epistolary relationship between a Canadian man and a Guadeloupe woman. It is also a love letter to the Haiku poetic form.). If you do get to read some of these books, I would love to hear your thoughts on them. Thanks for your suggestions! I have added them all to my list! And, I hope you get a chance to read And the Birds Rained Down – I’d like to know what you think!